Saturn is the only planet visible to the naked eye at night this August. Face southwest at dusk and you’ll see Saturn near a star of similar brightness—Spica in Virgo. Saturn is a bit to the right of Spica as you face southwest. The ringed planet remains well placed for evening viewing and remains in the night sky until late September 2011. Mars and Jupiter are in the pre-dawn sky. 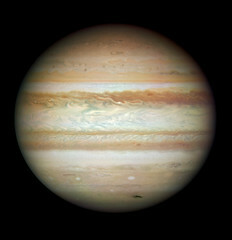 Jupiter, set against a background of very dim stars, dominates the southeastern pre-dawn sky and is due south at dawn by the end of the month. Mars is dimmer and much lower in the east northeast. It has fully emerged from the sun’s glare and will brighten slightly each morning. Venus is now out of sight. Superior conjunction (alignment on the far side of the sun) is on August 16. The Big Dipper is to the left of the North Star, with its handle pointing up. From that handle, you can ‘arc to Arcturus’ and then ‘speed on to Spica’; those stars are in the west and southwest at dusk. Antares, brightest star of Scorpius, the Scorpion, is in the south, with the ‘teapot’ of Sagittarius to its left. Meanwhile, the Summer Triangle is approaching the zenith. The stars of summer now dominate the evening sky. In late evening, you can watch the Great Square of Pegasus rise in the east. 1st Quarter August 6, 6:08 a.m.
Full Moon August 13, 1:57 p.m.
Last Quarter August 21, 4:56 a.m.
New Moon August 28, 10:03 p.m. The annual Perseid Meteor Shower peaks this year on Saturday morning, August 13. Unfortunately, the moon (full on the 13th) hides all but the very brightest meteors and thus spoils the show. If you want to see just how many Perseids can outshine the moonlight, the best hours are from roughly 2 a.m. to dawn. 1. Can you define light years? 2. How many galaxies are in the universe? 1. One light year is the distance that light travels in a year. The speed of light is 3 X 10 ^8 (300 million) meters/second, so light travels about 9.5 trillion kilometers (about 6 trillion miles) in a year. 2. There are so many galaxies that we have no reliable number. For one thing, the observable universe (the part we can see) is only part of the entire universe. According to our best estimates, there are hundreds of billions of galaxies in the universe. I’m looking for the September night sky info. Have you posted it yet? I share this info with the teachers and students on my campus. Thanks for sharing this information with your colleagues and students!